The Pen tool creates precise curved and straight-line segments connected by anchor points. If you click with the Pen tool, you will create corner points and straight-line segments with no direction lines. If you drag with the Pen tool, you will create smooth curve points and curve segments with direction lines. The distance and direction in which you drag the mouse determines the shape of the curve segment. The Pen tool is the most difficult tool in Illustrator to master. Patience and practice are required to become comfortable and adept using it. Click in the work area to create an anchor point. Click to create a second anchor point. A straight-line segment will connect the two points. Click to create additional anchor points. They will also be connected by straight-line segments. Pull down Edit and pick Select None. To complete the shape as a closed path, position the Pen pointer over the starting point (a small circle will appear next to the pointer), and then click. If you use the pen tool when your illustration is in Preview view and a fill color is selected on the Paint Style palette, the Pen path will be filled as soon as three points are created. To create segments that appear as lines only, choose a Fill of None and choose a stroke color before using the Pen tool. Hold down shift while clicking with the Pen tool to hold your line to the nearest 45-degree increment. Press and drag to create the first anchor point. The angle of the pair of direction lines that you create will be determined by the direction you drag. Release the mouse and move it away from the last anchor point, then press and drag in the direction you want the curve to go to create a second anchor point. A curved segment will connect the first and second anchor points, and a second pair of direction lines will be created. The shape of the curved segment will be defined by the length and direction you drag the mouse. Remember that you can always reshape the curves later. Drag to create additional anchor points and direction lines. The anchor points will be connected by curve segments. To complete the object as a closed path, position the Pen pointer over the starting point (a small circle will appear next to the pointer), drag, then release the mouse. The fewer the anchor points, the smoother the curve, too many anchor points will produce bumpy curves. If the last anchor point was a curve point and you want to convert it into a corner point, click on it with the Pen tool, and continue to draw. One direction line will disappear. If the last created anchor point was a corner point and you want to convert it to a curve point, position the Pen tool pointer over that last anchor point, then press and drag. A direction line will appear. You can use the Pen tool to create non-continuous curves (segments that curve on only one side of the anchor point, like a series of archways). 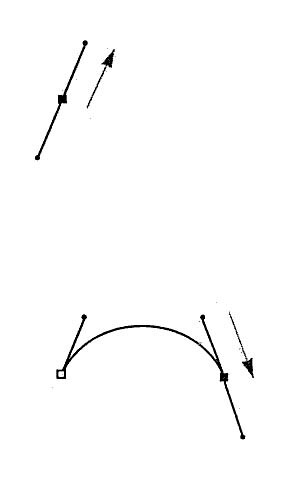 The anchor point that connects non-continuous curves is called a corner point. If you move one direction line from a corner point, only the curve on the same side of the point will reshape. 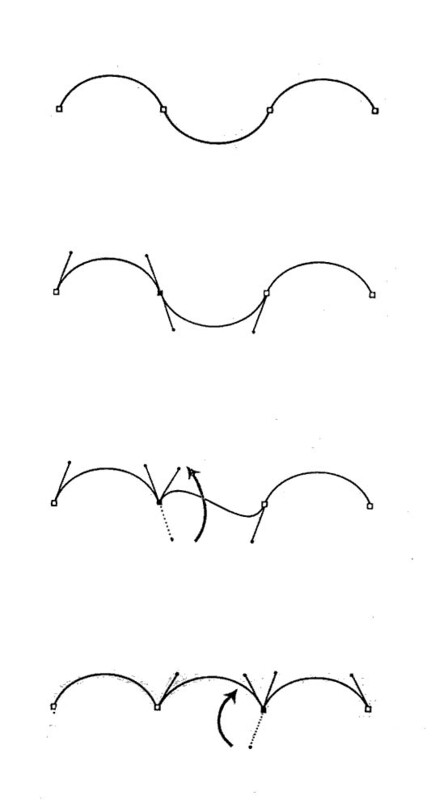 Continuous and non-continuous curves can be combined in the same path. 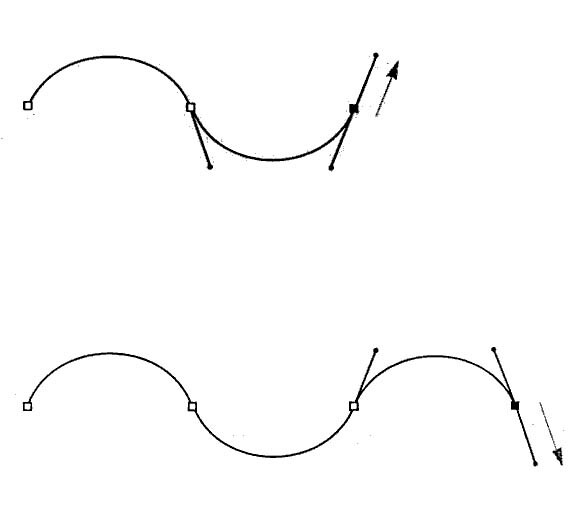 Two methods for producing non-continuous curves follow. 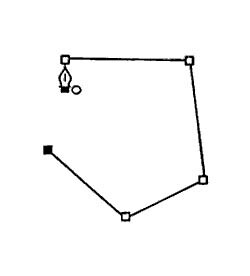 In the first set of instructions, you will press and drag to create an anchor point first, and then hold down Alt (Option/Mac) to redraw the direction line for that anchor point. Press and drag to create the first anchor point. Release the mouse and move it away from the last anchor point, then press and drag to create a second anchor point. A curve segment will connect the first and second anchor points, and a second pair of direction lines will be created. The shape of the curve segment will be determined by the length and direction you drag. Hold down Alt and press and drag from the last anchor point in the direction you wish the new curve to follow. A new direction line will be created. Repeat steps 3 & 4 to create a series of anchor points and curves. Use the previous procedure to create an open path with smooth curves. Choose the direct selection tool. Click on the anchor point to be modified. Hold down Alt (Control/Mac) to temporarily use the covert-direction-point tool and rotate the direction line so it forms a “V” shape with the other direction line. The curve segment will be on the same side of the anchor point as the previous curve segment. Repeat steps 4 – 6 to convert other anchor points. Hold down Alt + Control (Option+Control/Mac) to use the convert-direction-point tool to move a direction line when the Pen tool is selected. To convert a pair of direction lines back to a smooth curve, choose the Direct Selection tool, click on the anchor point, choose the Convert-direction-point tool, then click on the direction line point.